Ventilation can be defined as the process of exchange of air between the lungs and the ambient air. In the clinical setting, a machine known as a mechanical ventilator is used to perform this function on patients faced with serious respiratory illness. Weaning is the gradual withdrawal of a patient from dependency on a life-support system or other form of therapy. Weaning a patient from a ventilator occurs when the condition of the patient improves and a decision is made to remove them from the ventilator through a trial of spontaneous breathing through the endotracheal tube and eventually extubation (removal of the tube). Minimise the damage to the lung caused by the ventilator known as ventilator induced lung injury (VILI). Breaths can be either controlled, assisted or supported by the ventilator. Controlled Breaths: These breaths are completely “controlled” by the ventilator. A ventilator is purposely never set up in a mode with controlled breaths only. However, controlled breaths are delivered for safety at a set time interval if your patient is paralyzed or doesn’t have a respiratory drive (sedation, comatose, ect). 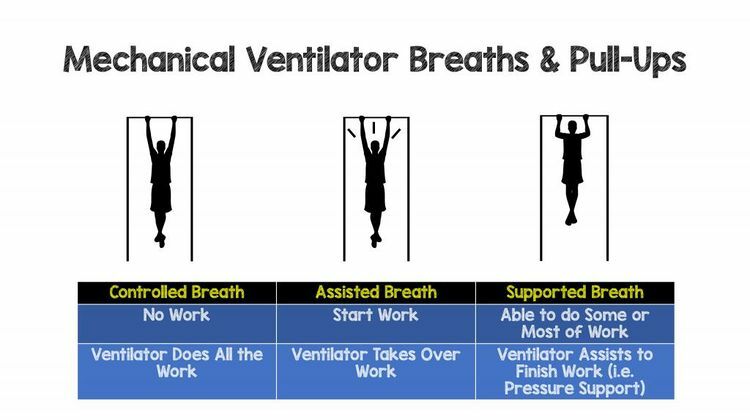 Supported (Spontaneous) Breaths: These types of breaths are triggered by patient effort (like assisted breaths), but once triggered the ventilator will give you some support, but not full support like an assisted breath. Weaning is gradual reduction of ventilation. In some cases this process is rapid and uneventful; however, for some patients the process may be prolonged for days or weeks. Weaning is a term that is used in two separate ways. Firstly, it implies the termination of mechanical ventilation and secondly the removal of any artificial airway. Traditionally, physiotherapists have been involved in the respiratory care of patients on mechanical ventilation in ICU. The respiratory care involves optimisation of ventilation, airway clearance, prevention of pulmonary complications, and hastening weaning from mechanical ventilation. ↑ 1.0 1.1 1.2 Miller-Keane OT, O’Toole M. Miller-Keane encyclopedia and dictionary of medicine, nursing and allied health. ↑ 2.0 2.1 2.2 2.3 2.4 2.5 MD, F. (2019). 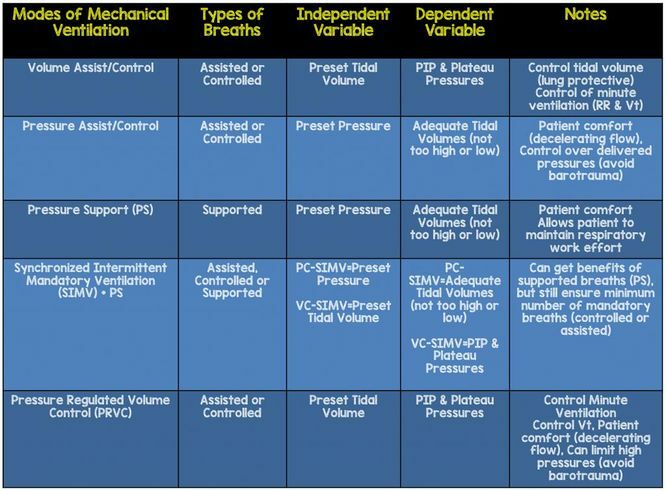 Simplifying Mechanical Ventilation – Part I: Types of Breaths - REBEL EM - Emergency Medicine Blog. [online] REBEL EM - Emergency Medicine Blog. Available at: http://rebelem.com/simplifying-mechanical-ventilation-part/ [Accessed 2 Mar. 2019]. ↑ 3.0 3.1 Bhat A, Vasanthan LT, Babu AS. Role of physiotherapy in weaning of patients from mechanical ventilation in the Intensive Care Unit. Indian Journal of Respiratory Care. 2017 Feb 1;6(2):813. ↑ 4.0 4.1 Boles JM, Bion J, Connors A, Herridge M, Marsh B, Melot C, Pearl R, Silverman H, Stanchina M, Vieillard-Baron A, Welte T. Weaning from mechanical ventilation. European Respiratory Journal. 2007 May 1;29(5):1033-56. ↑ Sengupta S, Chakravarty C, Rudra A. Evidence-Based Practice of Weaning from Ventilator: A Review. ↑ Arnal JM. Clinical practice guidelines for weaning critically ill adult patients from mechanical ventilation. ↑ Haas CF, Loik PS. Ventilator discontinuation protocols. Respiratory care. 2012 Oct 1;57(10):1649-62.